Tue, Oct 23, 2018, 07:50 pm SL Time, ColomboPage News Desk, Sri Lanka. Oct 23, Colombo: A delegation from the U.S. Department of State's Office of Weapons Removal and Abatement visited Sri Lanka from October 8 to 12, 2018 to observe U.S.-funded demining activities and meet with some of the beneficiaries of these projects. 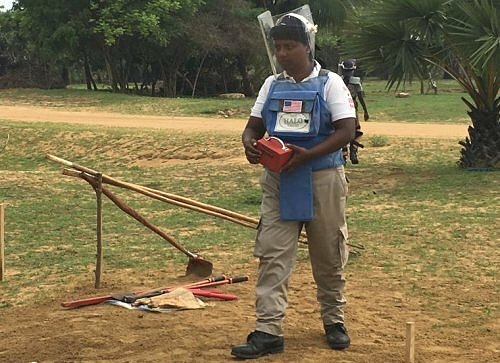 The projects are part of the nearly 600 million Sri Lankan rupees ($3.5 million) in assistance that the U.S. Department of State has provided towards Sri Lanka's demining efforts in fiscal year 2018. The group met with the Ministry of Re-settlement, the National Mine Action Center, and the Sri Lanka Army's Engineering Brigade and traveled to Jaffna, Kilinochchi, Vavuniya, and Mannar to review mine clearance operations. During meetings with families who had returned to their homes on land recently released back to them, the delegation heard about the impact mine clearance has made on the daily lives of local residents. Thus far in 2018, U.S. funding has cleared 1.86 million square meters and safely removed 9,344 land mines and unexploded ordnance and 8,637 items of small arms ammunition. "We are proud to support Sri Lanka's national mine action strategy and the goal of making Sri Lanka mine-impact free by 2020," said Chargé d'affaires Robert Hilton. "Landmine removal directly supports peace and reconciliation in Sri Lanka by allowing citizens to return safely to their homes, businesses, schools, and places of worship." Since 2002, the United States has provided more than Rs. 9.5 billion ($56 million) to clear explosive hazards in Sri Lanka. Thanks to U.S. funding and in cooperation with the Sri Lanka Army, the Batticaloa District was declared mine-impact free in 2017. 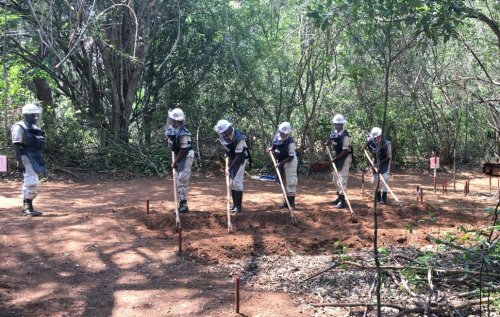 U.S. funding continues to assist in clearance efforts in the other eight districts affected by landmine contamination and currently supports 664 de-mining jobs across the Northern and Eastern Provinces. The U.S. Government has assisted in clearance operations through its local partner the Delvon Association for Social Harmony and through international partners such as HALO Trust and the Mines Advisory Group. U.S. funding has supported training and provided equipment to the Sri Lanka Army, including specially trained dogs for mine detection. The United States has also funded mine risk education through the international partner Spirit of Soccer.